A password or the answer to a question. It’s the most common and not seldom the only factor used by computer systems today. A Smart Card or phone. Phone is probably one of the most common factors in use today aside a shared knowledge. A system that takes more than one factor into account for authentication is also know as a multi-factor authentication system. Knowing the identity of a user up to a specific certainty can not be overestimated. All other components of a save environment, like Authorization, Audit, Data Protection, and Administration, heavily rely on a strong authentication. Authorization or Auditing only make sense if the identity of a user can not be compromised. In Hadoop today there exist solution for nearly all aspects of enterprise grade security layers, especially with the event of Apache Argus. They all start with implementing a strong authentication using Kerberos. 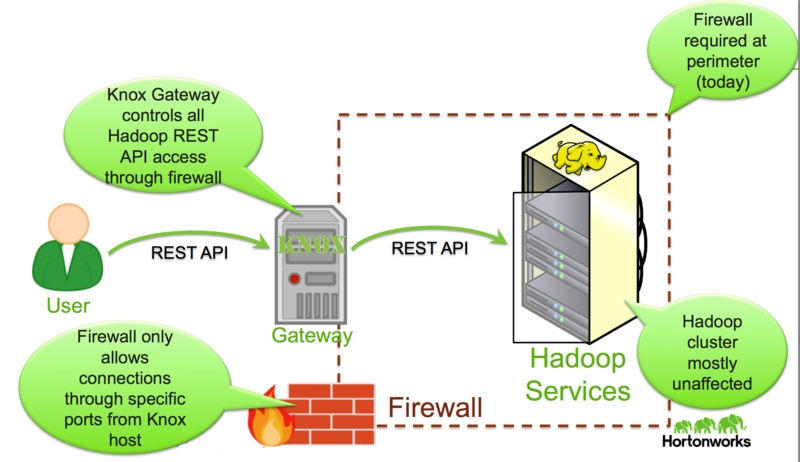 Concerning Kerberos with Hadoop there is no real choice as one is either left with no authentication (simple) or Kerberos. The other real solution would be to disallow any access to the cluster only within a DMZ using Knox gateway. Not only since Microsoft integrated Kerberos as part of Active Directory it can be seen as the most widely used authentication protocol used today. Commonly when speaking of Kerberos today people refer to Kerberos5 which was published in 1993. From here we’ll go ahead an configure a Hadoop installation with Kerberos. As an example we are going to use Hortonworks Sandbox together with Ambari. Before we get started we’ll setting up a kerberized environment we would need to install Kerberos on the sandbox VM. In addition we also need to create a security realm of which to use during setup. $ kadmin.local -q "addprinc sandbox/admin"
Authenticating as principal root/admin@MYCORP.NET with password. Read here for using the Ambari security wizard since Ambari 2.X to kerberize a HDP cluster with exiting KDC. 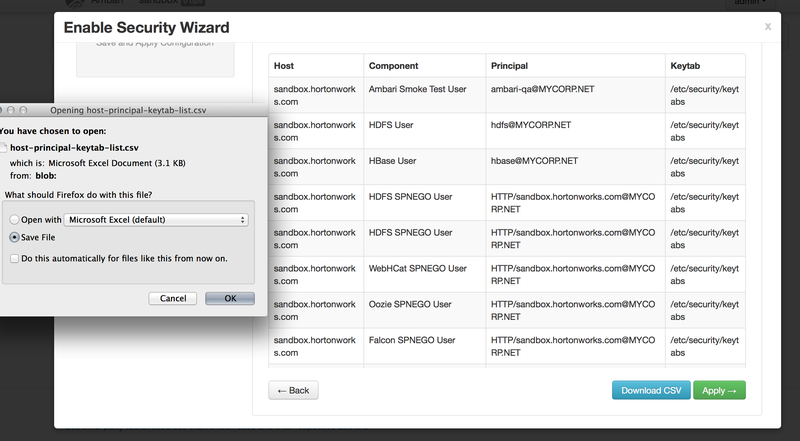 Ambari gives us a smooth wizard we can follow in order to kerberize our Hadoop installation. Go to Ambari Admin an follow the Security menu and the provided enabling process. You can then use Ambari to configure the realm for the required keytabs that we’ll be creating throughout the rest of this process. Move the downloaded CSV file to your sandbox using scp. Ambari provides us with a script we can use, which will generate the keytabs based on the CSV file we previously created. 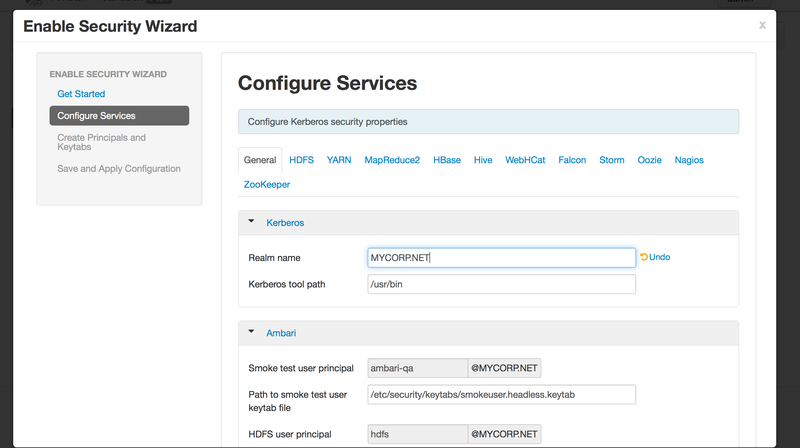 This should create you the needed keytabs to run Hadoop services in a kerberized environment. The keytabs are made available in the keytabs_sandbox.hortonworks.com folder or as a tar archive keytabs_sandbox.hortonworks.com.tar. Unfortunately is the keytabs.sh script not complete. In order to crate also a keytab for the ResourceManager of YARN, go into the gen_keytabs.sh script and copy for example the line kadmin.local -q “addprinc -randkey oozie/sandbox.hortonworks.com@MYCORP.NET” and change oozie to rm . We are now ready to have Ambari restart the services while applying the Kerberos configuration. This should bring everything back up in a kerberized enviornment. The Timeline Server is part of YARN please check /var/log/hadoop-yarn/ on the Timeline Server node for it's error logs. Ambari disables the Application Timeline Server (ATS) automatically as part of the “kerberization”. The ATS does not play well together with Kerberos at this time. You’ll notice that’s mentioned when starting the process, and again on the final page of the wizard (shown above, as the last figure). It is not advisable to try to start it manually. This does not sound right. Did you create the additional keytab for the YARN RM as mentioned in the post? What is the error message you are seeing? This is working for me with HDP2.1.3.